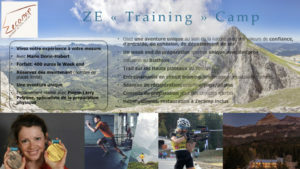 Even though Zecamp is a base camp for outdoor sports, the gym is still a necessary passage because any physical activity is prepared upstream through muscle strengthening. Indeed, sheathing and bodybuilding are strong assets to master a gesture, gain in power and save energy, as well as to protect you from injuries related to your practice or even occuring in everyday life. An indoor area of 55m² with cardio training equipment, weight machines, dumbbells, bars and free weights to meet the needs of each sport and offering great freedom of movement. 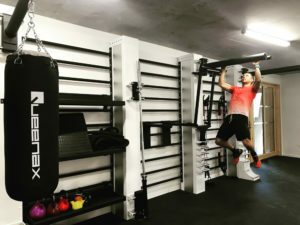 In addition, our area is equipped with the QUEENAX brand WALL SOLUTION (to be discovered here), with a multitude of options that promises to revolutionize your training circuits! A semi-exterior area of 45m² next to the first one and located under the terrace of the restaurant. This area is oriented to free weights and offers great opportunities for exercise while enjoying the mountain air! These three areas are inter-connected in order to offer to offer varied, complete and adaptable sessions according to the weather conditions! And as we have been aiming to make indoor sports and outdoor sports as compact as possible, the area is accessible from the outside of the building to facilitate the indoor / outdoor sports combination, and is also being connected directly to the roller-ski slope, allowing you to leave the building ” skis on feet ” 365 days a year! This areas is open to all, all year around. Please note that we offer the opportunity for resident sports groups in Zecamp to book exclusive gym slots for their specific sessions during their stay. At these times no access is granted to external users. Access will thus vary and is established weekly and visible on the website or directly in the reception area. Outside these particular dates, the area is open from 9am to 7pm all year long. Access limited to 15 people at the same time. Cold bath: Cryotherapy is as old as the world, and its analgesic action is well proven. In addition, it brings very beneficial results for physical recovery, hence its wide use by the sports people. Even if the cold bath is not the most attractive form of cryotherapy, its simplicity of use and its effectiveness make it the number 1 tool of many sports people. Once your Zecamp sport session is finished you will be able to immerse yourself partially or completely (according to your motivation!) in a cold bath at around 7 ° C, in order to recover physically to be in full possession of your means the next day ! Box de massage : Notre espace récupération propose également un box de massage avec une table, pour offrir un espace soin aux équipes sportives qui en ont l’utilisation. Massage Box: Our recovery area also offers a massage box with a table, to provide a space for sports teams who have use fot it.